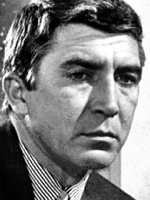 Patrick O'Neal was a very successful Hollywood leading man. He appeared in Tatum in Papermoon. Tatum O'Neal is the daughter of Ryan O'Neal. Patrick is not related to either and was not in "Paper Moon". Perfect in the role of an amoral cad. Somehow loathsome and likable at the same time. Patrick Wisdom O'Neal (September 26, 1927 – September 9, 1994) was an American television, stage and film actor and New York restaurateur. O'Neal was seen mostly as a guest star on US television throughout four decades, beginning in the 1950s. In the early 1960s he received critical praise for his leading role on Broadway in Tennessee Williams' The Night of the Iguana. O'Neal appeared in several films of the mid-1960s. In 1969 he had a leading role in John Huston's The Kremlin Letter, and a supporting role in the western El Condor, starring Jim Brown and Lee Van Cleef. He appeared in the 1973 hit The Way We Were. In 1972 he portrayed a murderous architect in the Columbo episode "Blueprint For Murder". In 1990 he played Police Commissioner Kevin Quinn in Sidney Lumet's Q and A.